AMC 'The Walking Dead' fan-favorite Daryl (Norman Reedus) has escaped death's clutches a number of times in four seasons, but might season 5 finally be the one to do him in? Yet another close-up new photo of the AMC monster drama's coming year has emerged, and the crossbow-wielding warrior looks to be in his most peril yet. 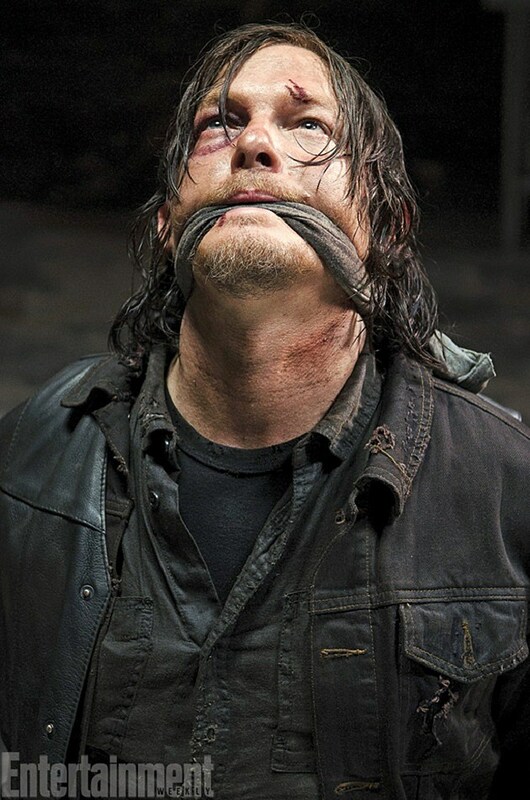 Courtesy of Entertainment Weekly, the scant new photo of 'The Walking Dead' season 5 sees Reedus' Daryl bound and gagged, likely at the hands of the mysterious (and grill-happy) Terminus Folk that ushered he, Rick and the others into a train car at the end of season 4 finale "A." The last shot we saw of Rick proved similarly close up, though without the gag to inform us how dire the group's situation had become. We'll learn more (and see a full trailer!) from the AMC drama's Comic-Con 2014 panel in the coming weeks, but in the meantime check out the latest photo from 'The Walking Dead' season 5 below, and tell us what you want to see from the show's return in the comments? Might we be saying goodbye to Daryl at last?